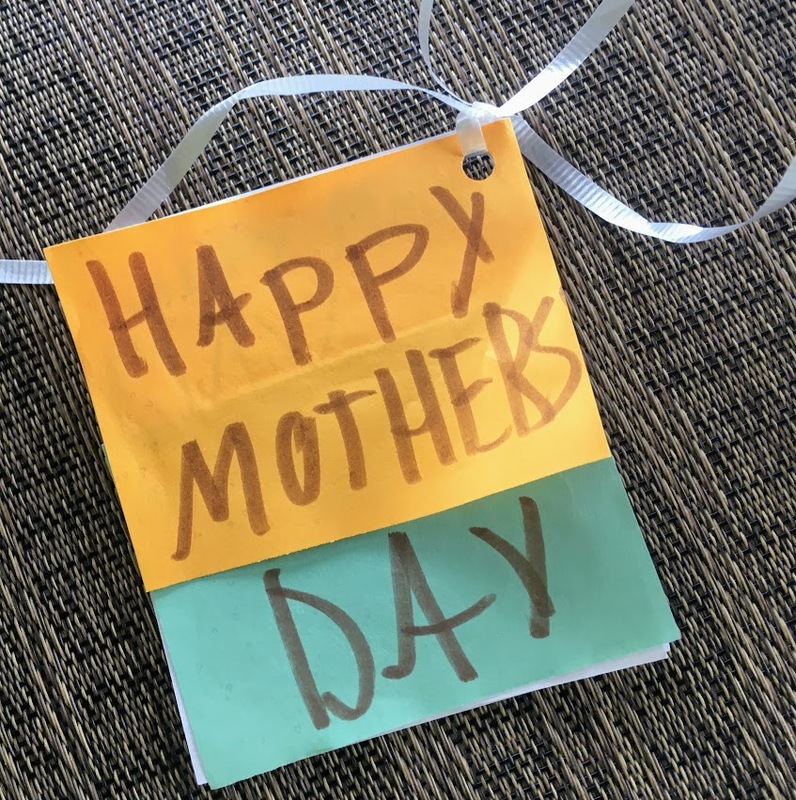 The sweet and sentimental cards received by mothers last weekend are being tucked away for safe-keeping. Others have made their way into the recycling bin. If the greetings from your family fell short this year, keep reading. I have a story to share, one I had forgotten until this past weekend. Really? Was that the thing that stood out for him? It wasn’t homemade muffins or read-alouds or cleverly-themed birthday parties? Or just that I was nice? Or that I had pretty hair? Weren’t these the things that children write to their mothers on this important day? I laughed as I pulled out of the driveway, recalling this card from years ago. Taken at face value, Max’s seven-year-old greeting likely reflected that we had top-notch babysitters. (And the babysitter package included pizza, movies, and ice cream. What’s not to like about that?) Reflecting back now, I see those words on the greeting card in a new light. Is it possible my children have observed I’m a better mother when I take care of myself? That I’m more compassionate about school mishaps when I take time to call a friend before they step off the bus? That I make better meals after enjoying a delicious meal out with my husband? That I can face the banal task of laundry accompanied by a podcast that inspires me? And that my work outside of our home makes me appreciate my hours at home? No, these things are likely lost on them. No one in my family is analyzing the variables that determine my happiness, nor should they. Fr. Mike Schmitz describes the blur that most of us are living. We start the day advising that others “get out of my way because I have something to do!” We live as if this urgent to-do list is the most important thing. Once we’ve checked off these to-dos, we switch to the next thing that dominates our time and attention, and so on. We plow through days and weeks and years … blind to the beauty of the present moment. We are unaware of the One who accompanies us — our friend, Jesus. We craft our identity on social media, looking for that perfect balance of dedicated parent and exciting social life. We observe what others are doing with their time and may subconsciously determine ours accordingly. FOMO (Fear of Missing Out) sets in making us hesitant to choose our friends, to pursue our interests, to commit to plans. If our days are a blur influenced by these contrived factors, how does the Holy Spirit catch up with us? What are you doing on June 24? Actually, don’t check your calendar just yet. There is likely something that has already made its way into your schedule — baseball tournament, swimming lessons, a neighborhood event. Let me rephrase my question: What will you do on June 24 to awaken your heart, to open your eyes to beauty, and to foster authentic friendships with other women? Meet me at The Well? The Well isn’t like anything you’ve experienced before. It’s original. It’s relevant. It’s fun. And don’t be fooled into thinking this will be a standard church hall experience. Think beautiful wedding venue with hand-crafted centerpieces cut from real trees in someone’s back yard. Think white linens and fancy cupcakes and lovely gift bags, intentionally chosen because beauty points us back to God. I offered to write this blogpost after being struck with FOMOW – Fear of Missing Out on the Well. The early bird deadline is fast approaching on Monday, May 22. I know it is difficult to dedicate time and money to something that seems indulgent. And it’s true, the cupcakes will be indulgent. Seeing how my own investment last summer has yielded the “hundredfold” in my life, the decision to buy a ticket (and help plan this year’s event) was an easy one. Don’t hurry back. You deserve a break. And by the way, they love it when you get babysitters. This entry was posted in Summer At The Well and tagged Blog, Blog, Summer At The Well. Bookmark the permalink.